Please submit your email address to view and download our current and historical market reports. Corporate Realty is proud to present the following office market reports. They are intended to give the reader a broad understanding of the market as well as specific information about occupancy and rental rates of individual buildings. They are created to be a resource for our agents as well as tenants, landlords, developers, lenders, our fellow brokers and anyone else looking for information about the Greater New Orleans office market. 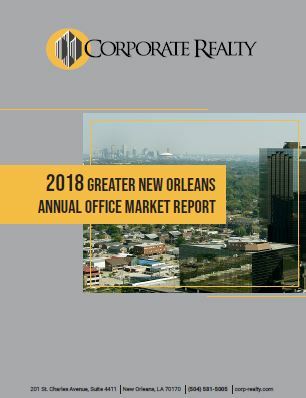 You can download our latest report here: 2018 Greater New Orleans Annual Office Market Report. Please contact one of the Corporate Realty office specialists if you have any question or would like more information about the Greater New Orleans office market.